That is what happens with the housing market each winter. Sales slow during the holiday season and don’t pick back up until the sun shines. That sun shines brightest first in Arizona and Florida, which is where we will be turning our attention in January as the first indicator of 2014’s housing market. Before the slowdown, I was expressing extreme concern that the market was getting overheated, as I was seeing flippers (and hard money debt available to flippers) reemerge. This slowdown should temper flipping. Move-up buyers. Affluent homeowners are a much higher percentage of activity than usual today. The more affordable locations in an area are generally weaker than the best neighborhoods, even though the price gap between good and bad locations may be near an all-time high. The median income household, which is usually the heart of the housing market, continues to struggle. Foreign buyers. In a number of markets, foreign buyers are playing a significant role in price appreciation. We are tracking exchange rates (which have been very favorable for many countries), foreign economic growth, and direct airline traffic for signs that this will continue. Boomerang buyers. 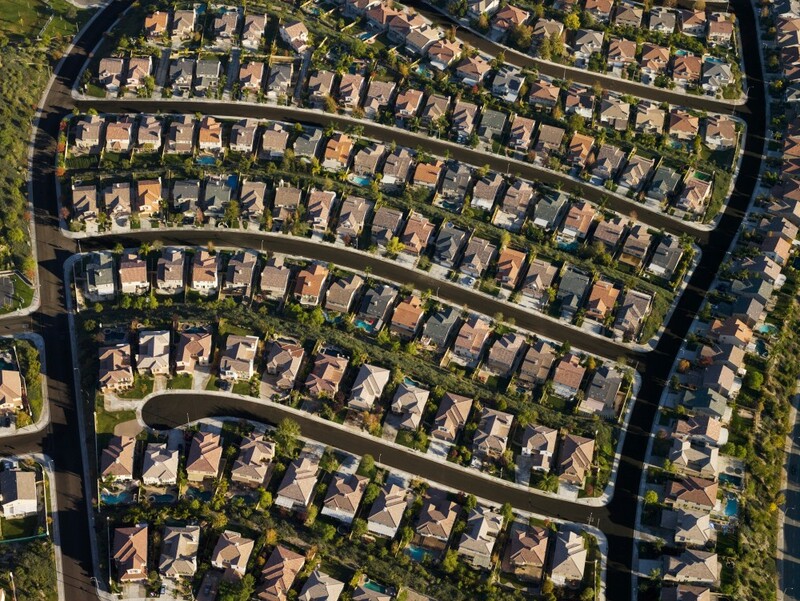 There are several million more single-family rental homes than there were several years ago. Many of these tenants are paying more in rent than they would in mortgage and property taxes if they became homeowners. How many of them can and will return to homeownership will be a key determinant of the housing market. Grade. A C grade on the index means that the indicators are at their historical averages, and it should be pretty self-explanatory what an A and an F mean. Trend. The grade is important, as is the direction that the grade is trending. When the grade is trending up, it signals that the fundamentals are improving and good housing market conditions should follow. The opposite is also true. Action to take. The index is really a self-fulfilling prophecy—the longer that times are good, the more supply usually shows up and the more affordability erodes, causing the grade to drop. That would be the time to take less risk. 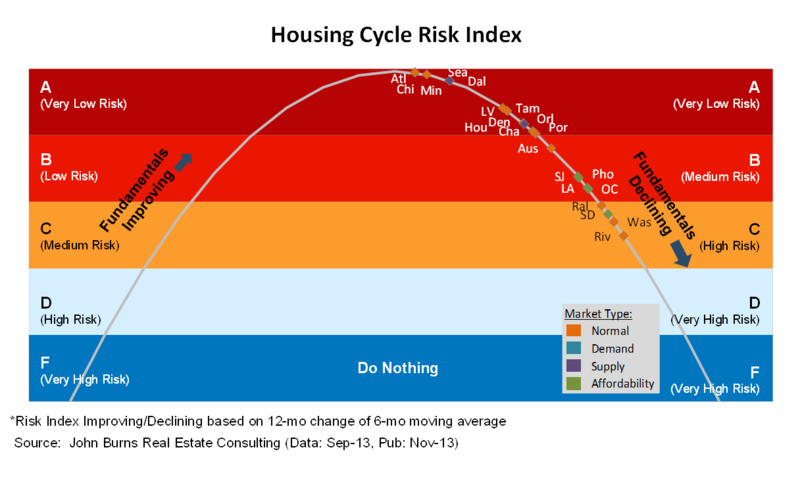 Conversely, the longer that times are bad, the lower the supply and the better the affordability. That is the time to take more risk, obviously with a longer-term view. Demand, in the form of both household formations / job growth and confidence to take on a 30-year mortgage, can come and go at any time. We advise our clients to invest aggressively when the HCRI grade moves from a D to a B and to invest more cautiously when it moves from a B to a D. An A grade is a great time to invest; an F is a great time to play golf. The current spot on the HCRI™ is shown in the graphic below. Most markets have A and B ratings and are trending down because affordability and supply were both better early in the year. This means that now is a great time to invest, although with far more caution than earlier in the year. That is not a blanket statement, however, as prices have moved much faster than the fundamentals, and it is easy to overpay. Our view on 2014 is in line with the consensus view that the economy is most likely to continue growing at its current pace, new home supply will continue to grow at a 15%+ clip but remain far below normal levels, and mortgage rates should remain in the 4.5% range. If that is the case, and there are no exogenous shocks from our leadership or elsewhere, demand will continue to exceed supply, and affordability will continue to be better than usual in most markets. This should give rise to a healthy housing market in 2014. Let’s all hold our breath. *I am borrowing this excellent analogy from Ara Hovnanian, CEO of K. Hovnanian.